Kenneth J. Lamberton is an American writer and former teacher. Born in Duluth, Minnesota, Lamberton attended the University of Arizona, where he received a Bachelor of Science degree in biology and a Master of Fine Arts in creative writing. He was working as a science teacher in Mesa, Arizona in 1985 when he was awarded a Teacher of the Year award. A few months later, the then 28-year-old Lamberton was arrested for child molestation for having an affair with a 14-year-old student and transporting her across state lines. During his twelve-year prison term at the Santa Rita unit of the Arizona State Prison Complex at Tucson, he participated in a creative writing program run by Richard Shelton and became a writer, penning essays for the prison magazine La Roca. 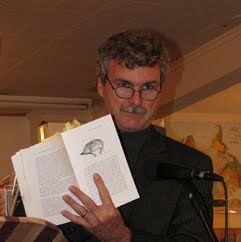 After his release on September 25, 2000, he began to publish non-fiction books and articles on natural history and crime and punishment in the Southwest. Lamberton has published four books since 2000 and written hundreds of essays and articles.